I am delighted to attach our final Whole School Evaluation (Management, Leadership and Learning) (WSE – MLL) report. The response of our Board of Management to the report is also included. I would like to thank our inspectors for their work with our school and for their diligence in having the report prepared so promptly. I would also like to thank all of our pupils, parents, staff and wider school community for your role in creating such a special school environment. I am especially proud that our school’s approach to supporting our pupils’ well-being was acknowledged in the report as being of an “exceptionally high standard”. As a staff, we are delighted that our approach to teaching, learning and assessment was commended. It is significant that in the report the inspectors call our school a “centre of excellence and innovation”. I believe our staff (teachers, SNAs, secretary) are due great credit for their outstanding professionalism. Our pupils are noted as being “curious, enthusiastic, highly motivated learners”. It is truly a pleasure to work with such wonderful pupils and staff. The report also contains recommendations to continue to improve the quality of education in our school, especially as we grow both in pupil numbers and staff size. We will of course take heed of these suggestions and I look forward to working collectively with our staff and families to ensure that our school is continuously improving and evolving. I have also attached an image of a tree that we completed to mark our first WSE. Each of the pupils has left their thumbprint as the leaves and the staff has left their thumbprint in the roots. This tree signifies our development to this point. 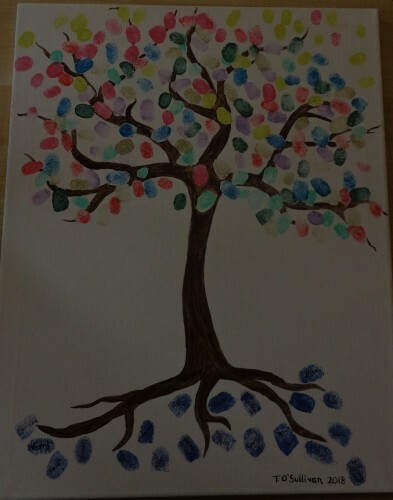 Thank you very much to one of our SNAs, Terri, who drew and painted the tree. We look forward to hanging this artwork, along with the WSE report, in the foyer of our permanent school building!